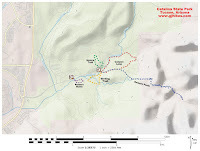 The Catalina Nature Trail is located in the Catalina State Park north of Tucson, Arizona. The trail climbs a small hill above the trailhead and makes a loop around the mesa before returning to the trailhead. The Nature Trail provides a relaxing educational experience in an outdoor setting where hikers can learn about the local desert ecosystem. The trailhead and parking area are at the end of the parks main road. Drinking water is available to fill up your bottles before you set out. A small gift shop and concession stand sells a few snacks and other items. From the parking area the trail climbs the small hill above the trailhead. Once the trail levels off it begins a loop. Numerous kiosks teach visitors about all sorts of animals, like the javelina, as well as the desert flora, geology and climate. During the early spring months countless wildflowers are in bloom. As the loop ends the Catalina Mountains provide a picturesque backdrop to the trail. The Catalina Nature Trail is a family friendly hike that visitors can use to augment their visit. The park includes a campground, several picnic areas and numerous hiking trails. 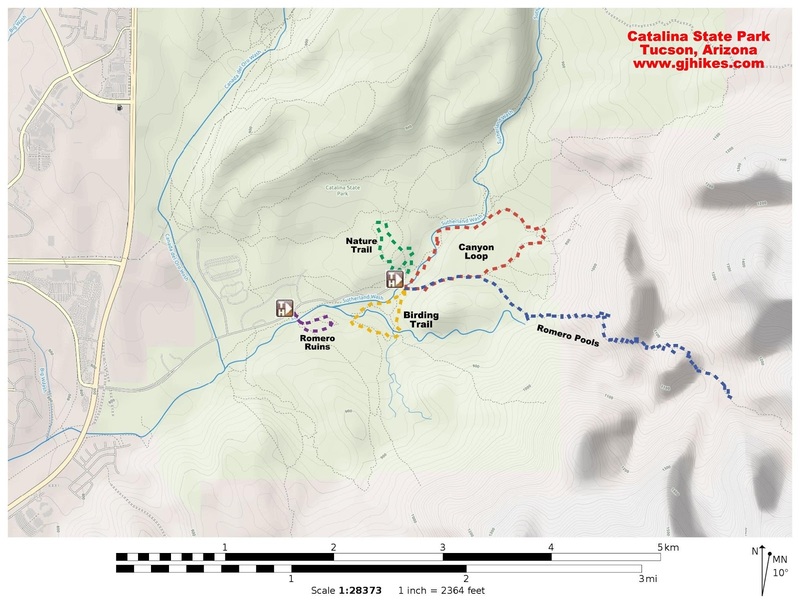 The Catalina State Park's website has a nice trail guide that is helpful for planning your itinerary. You might want to print the guide and bring it with you just in case they are out of them when you visit. On our website you will find slideshows and information on most of the shorter hikes that will give a little better idea of what each trail is like. If you would like to see it for yourself then all you have to do is 'Take a hike'.